We are going to Montreal in the wintertime – yes, you read that right! 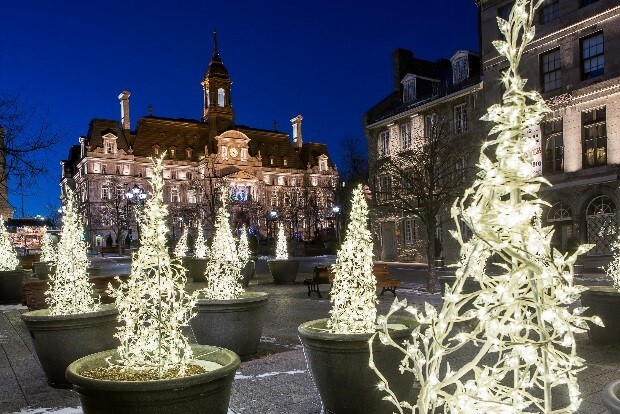 There are so many unique opportunities in December that we just couldn’t resist… We’ll discover Montreal’s techno savvy in interpreting its 376 years of history, a unique artist and artisan show, winter holiday traditions, and how this cosmopolitan city embraces the dark days of winter with an explosion of light. We’ll stay in historic Old Montreal, where many of the city’s cultural attractions are just steps away. This is a “last minute” trip opportunity, please register soon! Download the application HERE or call (585) 546-7029 x 11. Montreal in December is a magical place. We’ll be staying in the most charming section of the city, in Old Montreal. Our historic hotel, Place d’Armes, offers modern comforts in a fascinating building, complete with restaurants and a luxurious spa. We’ll be steps away from many activities! History: Most likely you’ve never had a guided tour like this. Cité Mémoire – “Memory City” uses augmented reality to tell the tales of people who shaped the city, as their stories are projected on buildings and cobblestone streets of Old Montreal. We’ll also enjoy a traditional tour with visits to historic homes, the spectacular St Joseph’s Oratory, and more as we learn about the winter holiday traditions and enjoy many decorative displays. The Canadian Centre for Architecture will round out our visit, with provocative exhibits in a gorgeous historic house. Artists and Markets: Our visit coincides with the 64th Annual Salon des métiers d’art de Montréal, an internationally renowned crafts show bringing together over 400 of Quebec’s leading artists. You’ll discover one-of-a-kind works of art and traditional crafts, gourmet foods, beverages and clothing. The Montreal Christmas Market will be in full swing. In the tradition of European Christmas Markets, you’ll find over 60 outdoor shopping huts, street performers, and food stands. Montreal also has over 20 miles of underground shopping, filled with art installations, where you will never need your coat. Don’t forget, the currency exchange rate makes gift shopping even more fun in Canada. Light: It gets dark pretty early in December – and Luminotherapie is the answer. Every year multiple installations enhance public space in the Quartier Des Spectacles (Festival Space.) They utilize light to create a sense of wonder and enjoyment. The 2018-19 edition is emphasizing active participation, inviting folks to share experiences with the installations. 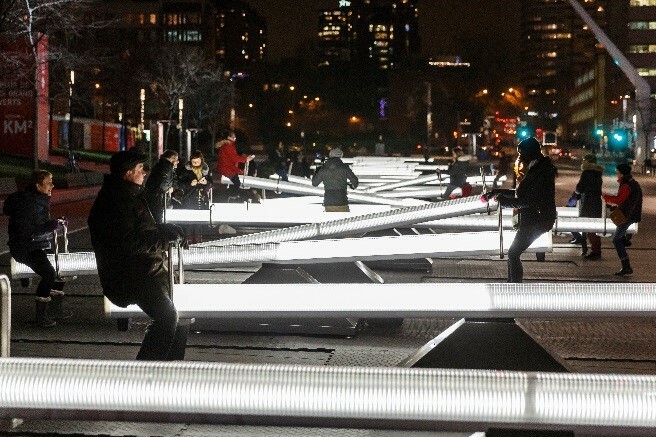 I don’t know how they will top the luminous swings and seesaws from past years. Light, architecture and history will come together when we attend Aura – a sound and light show inside the Notre Dame Basilica. One of the most highly decorated church interiors in the world, Aura highlights the details with evocative lighting, followed by a music and light show that brings the interior artwork vividly to life. Free time: The day of the Salon you’ll also have free time, to explore areas that interest you. You may spend a longer time at the crafts show – or even skip it, if you wish. You might enjoy the Jewish Museum of Montreal, the Museum of Fine Arts, or even The Barbie Expo (1,000 Barbie dolls dressed in haute couture!) We’ll include a 24-hour Metro Card, should you wish to use the Metro (subway) or buses. It is a very walkable city – and remember, many neighborhoods can be reached through the underground network. Click HERE for a more detailed itinerary. What’s included: Luxury motorcoach transportation from Rochester, 3 hotel nights, breakfast each morning, 2 lunches, 1 brunch, 2 dinners; all taxes and gratuities, all admissions and tours, all escorted by Landmark Society staff.